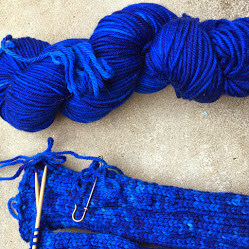 Elliebelly Knit & Dye Works > Blog > Dyeing > Postponed Knitting: Is It A Match Or Not? Postponed Knitting: Is It A Match Or Not? The I've-Run-Out-Of-Yarn disaster I wrote about here is possibly on its way to a fix. I got two skeins of what was supposed to be the same yarn, and set out to dye a near match. When I realized I had a problem, I was optimistic about finding the right yarn, less so about being able to get a precise dye match. Instead, the opposite occurred. My yarn, which was labeled as a sample skein is a good bit thicker than the skeins I received in the mail. This makes sense, as the yarn I was knitting with looked heavier than a DK weight to me from the get go and that would explain why I ran out, despite having enough yarn for the pattern requirements. I'm going to try and finesse that problem by knitting loosely. I may be fooling myself, but time will tell. The dye job looks like it may be close enough — I'm not quite willing to commit until I knit a swatch. The dye recipe and process were well documented in my notes, but as a dyer, one worries about the variables you don't always document and can't always control — what was the ambient temperature, how warm was the dye bath (I typically make mine room temperature but I don't measure precisely) and how long did I take to bring the dye bath to the correct temperature. Typically I don't worry about these matters because I get consistent enough runs, but here, a precise match is pretty important. Visually, the new yarn looks a lot like the yarn I've been knitting with. I'm hopeful. And in the end, these are meant to be warm mittens for cool morning, and not an artistic masterpiece. Still, if I'm going to take the time to knit it I want it to be something wonderful. And I've realized that if the new yarn doesn't work, I can simply start over and knit a new pair, now that I've got a full four ounces to play with. Problem solved. I adore this color! You will have warm pretty hands no matter what the matching results are.